Jeff draws digitally aboard cruise ship while connected to a massive two-story sceen visible from two levels. Your company spends too much money to attend a trade show not to get the recognition they deserve. Caricature.com innovated Digital Caricatures at least 15 years before the rest. We even appeared in Walt Disney World in the mid 90s. We know what it takes to please a client and dazzle the guests. Digital Caricatures brings them into the booth in droves. Each attendee receives a color print (in badge holder if desired) and can download their face from our site after the event. Our laptop can be hooked up to one or more monitor devices resulting in large crowds. Each drawing only takes a few minutes and couples can be drawn together. Customized backgrounds can be added for that extra personal touch. Your company's logo and phrase is always included for free on every printout. Prints are 4x6 glossy photo paper. We even bring an extra printer as a backup. 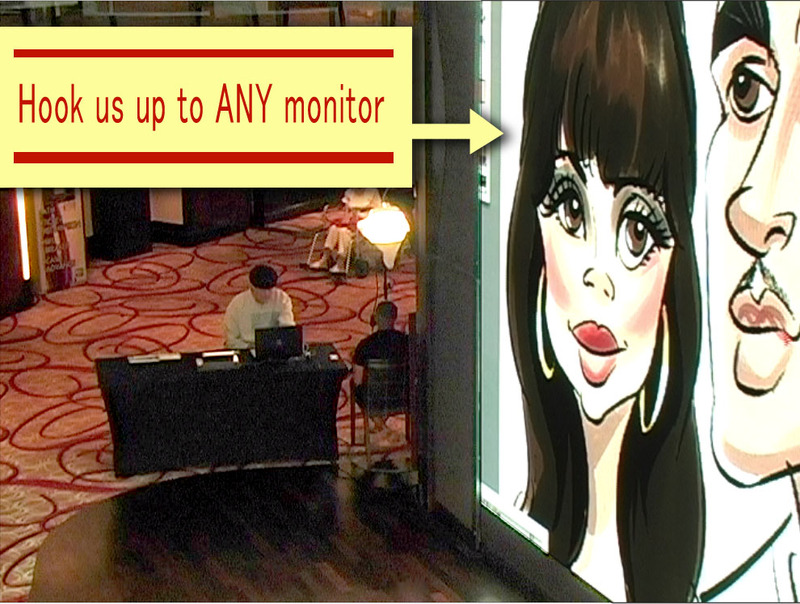 Digital art can be created before your event date to complete the theme of the booth.